Since when are rising oil prices a positive for the markets? Intuitively it seems reasonable to associate lower oil prices with net benefits for the consumer and the overall economy. This should help appreciate asset prices. In the past 12 months, however, oil prices and the stock market have traded in lock-step. The correlation is positive and clearly observed in the charts. Nevertheless, traces of causality are hard to find. 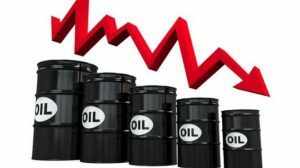 In this article, we will discuss the negatives and positives of lower oil prices on asset valuations. Additionally, we will present a case study in which there is an ‘oil price shock’ and elaborate on its effects on monetary policy and the real economy. The topic of this article is somewhat complex, as many variables are in play. WTI Crude oil prices have declined significantly after reaching highs of $125 a barrel in 2014, reaching a bottom of $28 in January this year. Since then, prices have recovered to $46 a barrel. Many opinions have been voiced on the volatility of this vital resource, but its influence on asset prices remains difficult to assess. At this point in time, we can clearly see a positive correlation: higher oil prices means higher stock indices. It’s very difficult to find a causality here. We will focus on WTI Crude and the American stock market. It could be the case that oil and stock prices move higher because expectations of economic growth are being adjusted upward, resulting in higher earnings and more demand for oil. This isn’t very likely, however, as global growth forecasts are being revised downward time and time again. One could also state that the extremely low oil prices had investors in a risk-off mode. The probability of defaults of oil companies was a big negative, as the sector is tied to many employees and different service companies. In addition, some banks have been generous with loans to these companies, and could be forced to downgrade the quality of these loans. This, in turn, leads to higher risk-weighted assets and calls for a stronger capital base. Short and simple: banks would be hit if the sector gets hit. With oil prices recovering to more moderate levels, this has put investors back into risk-on mode, offering upward momentum for major indices. In any case, the correlation is clear: markets seem to think higher oil prices are positive for stock prices. To make this assumption more valid, let us rephrase: markets seem to think that, for the last 12 months at least, higher oil prices are not a negative for stock prices. The price of oil moves due to a multitude of reasons. We will focus on three in particular. Firstly, prices have to strike a balance due to supply and demand effects. If supply falls short, or demand is rising, oil prices will move upwards. This fundamental reasoning is not enough to explain severe volatility in the price. It is, however, a first good reason why oil prices have declined since 2014: Iran has re-entered the world market with its massive oil supply, and growth of demand in China has been uncertain. These two facts have put downward pressure on the price. Secondly, major political events can move the price of oil. The nuclear deal struck by Iran and the UN Security Council (14/07/15) has opened up massive supplies to the world. Alternatively, war or political instability can cause shocks to the downside for the production of oil, in turn driving its price higher. Another driver is technological innovation. If it gets cheaper to get oil out of the ground, this benefit will be divided into more profits for the exploration company and more buying power for the consumer. A prime example is the innovation of shale oil drilling. The United States have increased their production of oil to extreme levels due to this innovation. Domestically, it now produces almost 10 million barrels of crude oil each day. This has been a major driver of the downturn in oil prices, as these shale producers are very nimble in closing down and opening up new rigs. Shale oil production has put a cap on oil prices. Whenever the prices would rise to more profitable levels, temporarily closed wells that have already been drilled (a lot of sunk costs have been made) will be depleted to reap in those profits. Many other factors are at play, such as futures trading, hedging, the negative effect of a stronger dollar, etc.. But in the end it all boils down to the fundamental balance of supply and demand. Keep that in mind while going through the article. A stronger dollar means lower oil prices, as this commodity is priced in US dollars around the world. We won’t get into detail as this article will be extensive as it is. 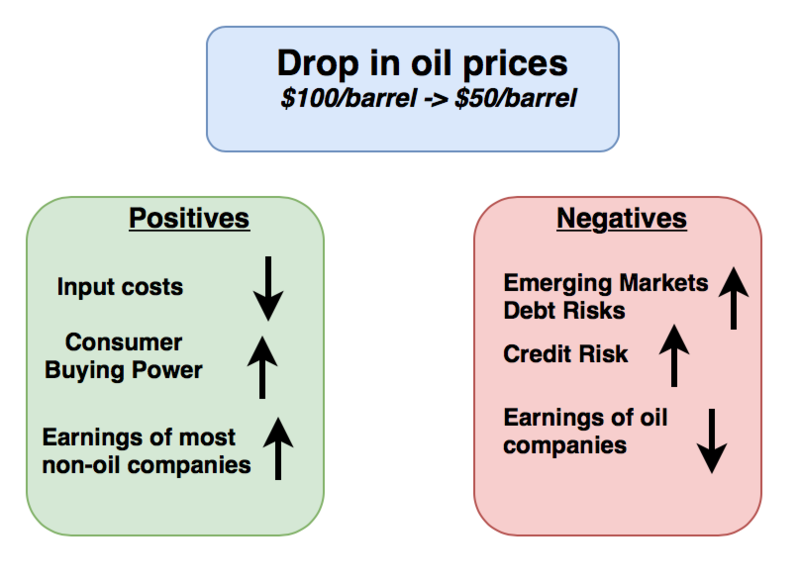 We can distinguish a couple of negative and positive effects of lower oil prices. First, let’s discuss the positives. Oil is a vital resource for our economy, as it is being used in many processes of production. For companies, lower oil prices should mean cheaper energy bills, cheaper transportation costs, cheaper materials (such as plastics), etc.. Ceteris paribus, lower oil prices should slash into some major costs of different businesses. Keeping the prices of their output the same, the drop in input costs should attribute to higher earnings. At the same time, lower oil prices result into higher buying power for consumers, even if companies would keep their prices at the same level. They would have to pay less for fuel and energy. Of course, this effect would be divided into a positive for both companies and the consumer. But higher oil prices have propped up the market for the last 12 months? Or at least, they haven’t halted the rally of the markets. It’s not clear whether this rally is driven by higher oil prices, or whether they are both moving simultaneously because of a change in sentiment and expectations on economic growth. Let’s assume the relief-rally in oil prices have pushed up markets. What factors could be at play? First of all, oil prices were at extremely low levels. So low in fact, that it entailed huge risks for major oil producing countries. Many emerging markets are depending on exports of resources to fund their public finances. Think about Nigeria, Russia, Saudi-Arabia, Iran, Venezuela, etc.. Other resources are priced upon the level of oil prices. Even countries that aren’t necessarily exporting oil are being hurt such as Brasil or Australia. Secondly, credit risk for oil companies has increased massively. Many oil companies started investing with $100/barrel as their benchmark. This not being the case, they are running into liquidity and ultimately solvency issues. Banks, in turn, have lent massive amounts to finance these operations. If they had to do write-offs on these loans, it would be another hit to this tainted sector. Banks being the backbone of the economy, we need them to be healthy! Finally, the oil sector is a massive one. When earnings of some of the biggest companies in the world are going down, this will hit ETF’s and stock indices alike. Oil producers use a lot of services to be fully operational. Consultancy, shipping, the chemical sector and others are being hit hard. Low-interest rates have pushed down yields on bonds. This has made stocks look cheaper relative to bonds. If you can have a bond with a 2% yield or stock with a 4% dividend yield, which one would you pick? Don’t get me started on the return you get on a savings account… One could also argue that bond prices are inflated because of these historically low rates. Expansionary monetary policy (low-interest rates) is meant to jumpstart the economy after the crisis we had. Low rates increase buying power of consumers because most of them are borrowers (at least in the US) and they can spend this extra cash on other stuff: it’s helping aggregate demand. Secondly, it has become very cheap for companies to finance their operations, which should help them in the long run. Governments are one of the main beneficiaries of this expansionary policy. They have to pay fewer interests on their debt and can use this extra cash to make structural changes, such as increasing austerity measures. We could state that an increase in the interest rate would be a negative for the economy and in turn the stock market. When the FED raised interest rates in December, it startled the markets and they dropped significantly in January. It has been 8 years since we’ve had normal interest rates and some say it’s about time to get back to more reasonable rates. Then why haven’t the policy makers done anything? The FED says they are data-depended. They need evidence that inflation is going to pick up. If inflation picks up, the interest rate must be adjusted upwards in order to keep inflation close to the 2% target set by most central banks. If inflation rises too rapidly, it will change inflation expectations and in turn, this could lead to hyper-inflation. A long story short: an abrupt hike in interest rates would be necessary if inflation skyrockets. There are many reasons why inflation hasn’t picked up yet, but let’s not get into detail. One thing is for sure, however, if oil prices were to double over the next months (if a deal gets made by OPEC for example, or if there is a war in the middle east), it would increase inflation significantly. A sudden spike in oil prices would hurt companies and consumers directly because of input costs and buying power, but it would also have major implications for the monetary policy of the FED. If they would have to rapidly increase rates, markets will not be ready for it. Previous Post: Does your bank have exposure to oil and China? Copyright © 2019 Ygrids. Powered by WordPress and Stargazer.